We have drawn on the natural and cultural riches of the British Isles to create the Noble Isle collection: the new tradition in luxury bathing. 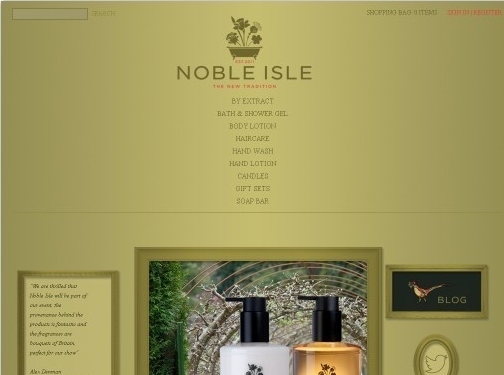 Taking inspiration from all corners of the Isles, from misty moorland and old English orchards to Highland distilleries and windswept coastal cliffs, Noble Isle’s high-performing bath and body products employ the finest fragrance and natural extracts, and the best of British design, to create a lasting sensory impression. Infused with signature fine fragrance, Noble Isle luxury hair products employ a complex of carefully sourced ingredients – natural oils, vitamins and British-origin botanical extracts – to accomplish vibrant, flexible and delicately scented hair. UK (Taunton) based company offering bath products for sale. Website includes e-commerce facilities, delivery (under "Delivery") and returns (under "Cancellation & Returns") information, terms and conditions, press mentions, blog, full company contact details.